It was a beautiful Thursday morning in Lima, Peru; 85 degrees and sunny. My commute to work was on a bus built for 40 people, but it was overflowing with people at almost triple it’s capacity. After previous trips, I have grown accustomed to feeling like the proverbial "sardine in a can" on my daily commute. Despite the steamy bus conditions, I arrived at my destination, SENATI, which is a technical institute in the northern area of Lima called Independencia. There are around 12 SENATI campuses in Lima, but the Independencia location is one of the largest campuses. 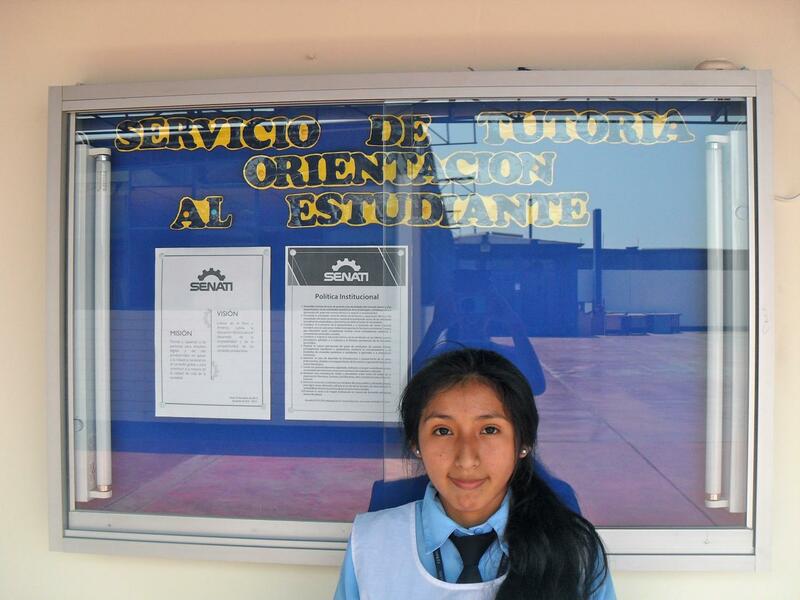 As a Kiva Fellow working with IPFE (Instituto Peruano Fomento Educativo), I have the opportunity to meet with several students of SENATI who take out loans with Kiva in order to support their education. Kiva specifically works with SENATI in order to fund technical degrees for students in the lower portion of the economical pyramid. Their degrees are obtained in approximately 3 years, though this varies depending on the major. During the final semesters, all students at SENATI spend most of their time completing internships with local companies in order to put what they learned in the first semesters into practice. Approximately 95% of the students who graduate SENATI find work within their first few months of graduation. All of the students I have spoken with who graduated have all found jobs and they love their work! On this particular Thursday, one student at SENATI stood out amongst the others. 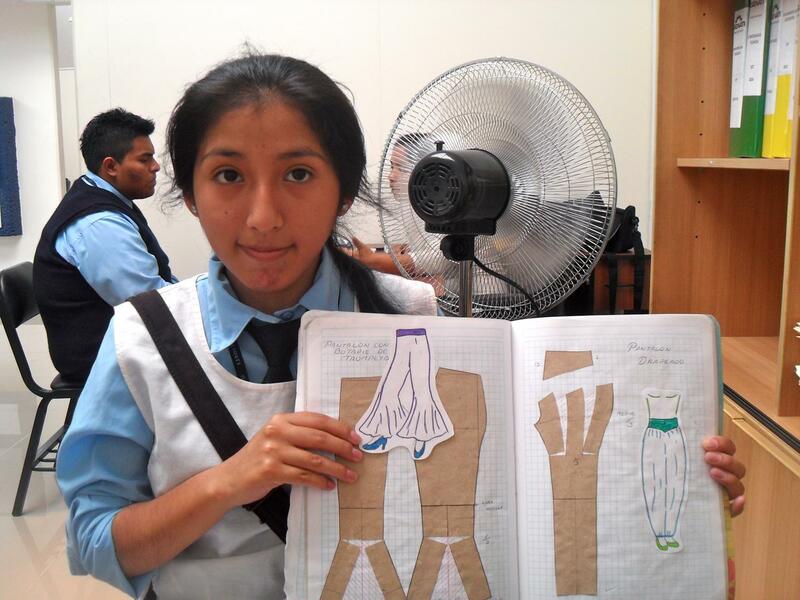 Her name is Andrea, a 20 year old student studying Textile Clothing Manufacturing at SENATI. In order to arrange my meeting with Andrea, I had to first speak with her mother. Her mother informed me that their family is currently undergoing a crisis with very limited money, and that she has not been able to afford lunch for Andrea the past few weeks. In addition, she informed me that Andrea recently recovered from an operation and had to postpone a semester of schooling. After knowing all of this prior to meeting Andrea, I was slightly nervous to speak to her. When Andrea walked into the room, she immediately greeted me with a huge smile and a kiss on the cheek. She told me how she is enjoying her final semester at SENATI and completing internships with a few local companies, where she assists in the operations of making clothes. Her dream for the future is to specialize her studies in chemical textiles and then own her own clothing manufacturer business. I typically ask all of the students if they have any questions for me towards the end of the conversation, and majority of them rarely have any. However, Andrea had at least 15 questions on the top of her head. We spent at least an hour in the office discussing life in the United States and Peru, family and friends, travels, and hopes and dreams for the future. Since I enjoyed her company so much and knew of her situation, I decided to invite her to lunch. Her eyes lit up with excitement when I invited her, and she immediately accepted my invitation. I met Andrea in the SENATI cafeteria for lunch, and paid 5.50 soles (less than $2 USD) for the daily menu, which consisted of an appetizer, meal, dessert, and juice. We continued to converse the entire meal about topics ranging from my favorite meal in New York to salsa dancing in the villages of Peru. I absolutely loved her curious mind, her eagerness to learn more, and that she always had a smile on her face. Both of us devoured our meals. After the meal, she gave me a huge hug and smile, and thanked me tremendously for the meal. I will never forget her glowing face and expressions of appreciation. They say that money can't buy happiness, and I do agree with that. In this instance, I believe that it wasn't necessarily the 5.50 soles I spent on her lunch that made her happy, but rather the initiative I took to invite her and our great conversation. Kiva Lenders are giving so much more than money to people like Andrea - they are giving people an opportunity to achieve their dreams. On behalf of Andrea to all of her Kiva Lenders, she wishes to say "Thank you very much because you are helping me without knowing me. Thank you for allowing me to complete one of my dreams." Born and raised in New Jersey to immigrant parents from the Philippines, Cassandra grew up as a first generation American with the mentality that each person should have an opportunity to improve his or her life. Cassandra's desire for experiencing different cultures was sparked during a semester abroad in Spain. Since then, she has traveled to more than 20 countries and has no intent to stop. She received her BA in Accounting with minors in Spanish and Business Information Systems from Lehigh University. After graduation, she moved to New York City where she began her career in KPMG's Audit Financial Services practice. After an arduous first year, she decided to spend three weeks volunteering at a childcare facility in South Africa serving impoverished children, many of whom lost their parents to HIV/AIDS and violence. This experience propelled her to give back in her local community. She is a “Big Sister” to a child from the Dominican Republic and serves on a Manhattan high school advisory board that aims to help its immigrant student base realize their fullest potential and gain access to higher education. The combination of these life experiences sparked Cassandra’s interest in microfinance and international development. She strongly believes that access to basic financial services can transform the lives of individuals, as well as have a positive impact on the broader community. Cassandra is eager to apply the skills she has learned, along with her intense passion to help others while she works at microfinance institutions in both Ecuador and Peru.